Confession: I'm a curly-haired girl. It's something most people wouldn't know, as I straighten my hair on a daily basis! (Once, a fellow student saw my ID and asked if I used to have a perm...) It's not that I don't love curls; when done right, they add gorgeous texture. But that's the thing ... it's so hard to keep them defined and frizz free that it's easier for me to reach for my ghd. That said, when Living Proof asked if I'd like to try their new 'Curl' haircare line, I decided to give curls another chance! If there's anyone I trust my hair with, it's Living Proof. My hair has two major issues: it's fine in caliber and has tons of frizz. Unfortunately, the solution to those two issues are at odds; volumizing products add texture (a.k.a more frizz) whereas the heavy oils and silicones in frizz control products tend to to pancake-flatten thin hair. Living Proof products revolutionized my haircare routine by providing both frizz control and volumization in one (seriously a dream come true! ), thanks to their patented OFPMA molecule. As a result, I've become quite the connoisseur of Living Proof haircare; my collection includes numerous products from their No Frizz, Volume, and PHD lines. Today, I have my review and thoughts on the new Living Proof 'Curl' line. Hopefully it will help those of you with curvaceous locks like myself! 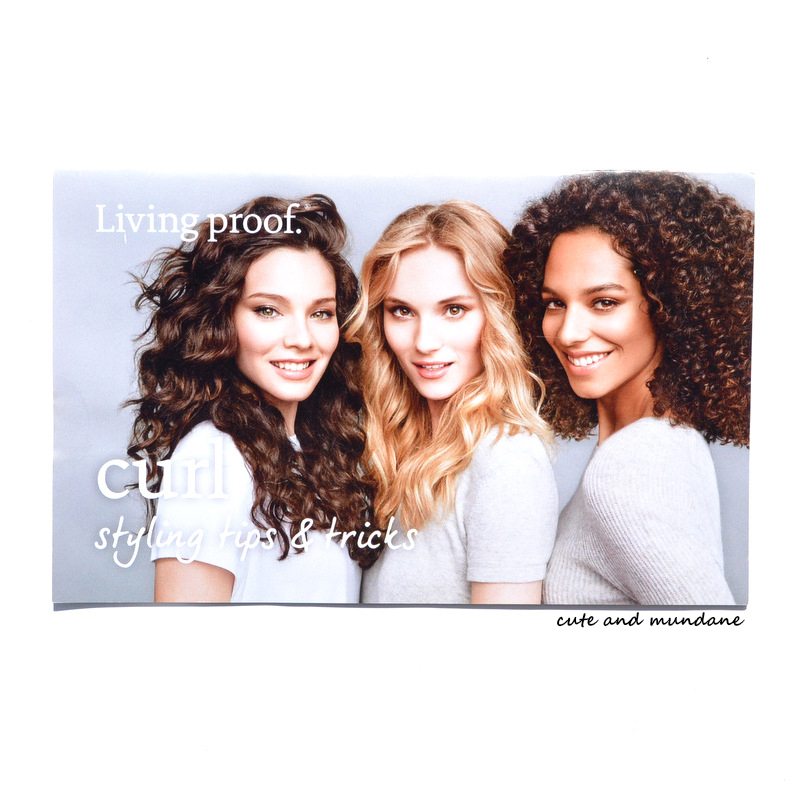 I loved the concept behind the promo photo for the Living Proof 'Curl' line (see above!). 'Curly' describes such a diverse range of hair types, from loose waves to tight tendrils. It's hard to imagine how a one-size-fits-all routine could deal with all these variations. I really appreciate how Living Proof addressed this in their new 'Curl' routine, which offers a number of different layers, and different finishing products depending on the kind of control each individual needs. The entire Living Proof 'Curl' haircare routine! 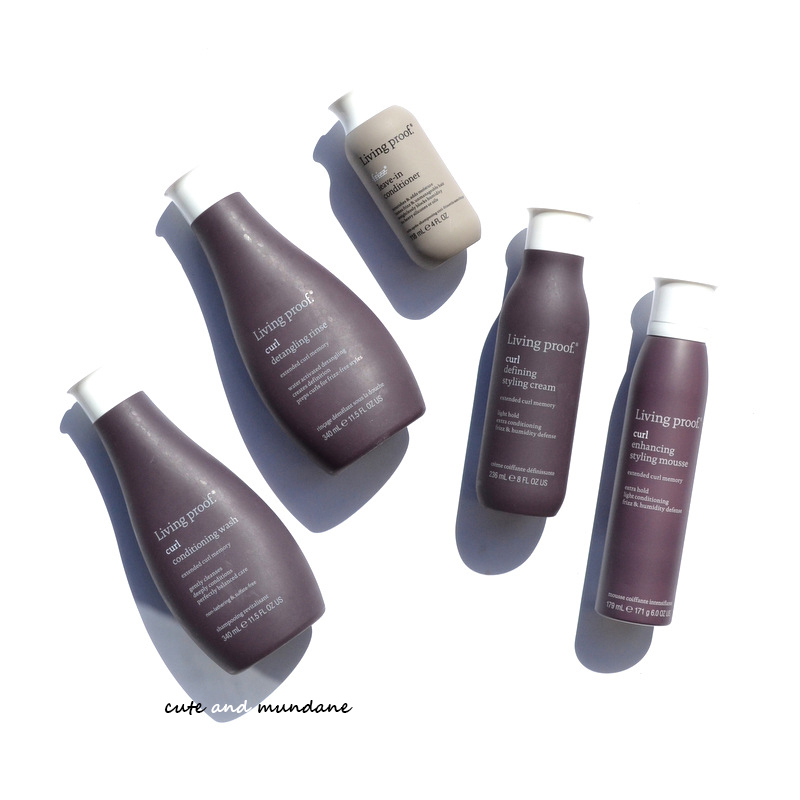 The Living Proof 'Curl routine consists of: Living Proof Curl conditioning wash, Living Proof Curl detangling rinse, Living Proof No Frizz leave-in conditioner, Living Proof Curl styling cream, and Living Proof Curl styling mousse. I'll conduct my review in the order that each product should be used! Since I'm talking about my curly hair gone wild, I figured I'd share a photo of my orchids... gone wild! I'm lucky that this particular plant seem to be blooming for the third year in a row! 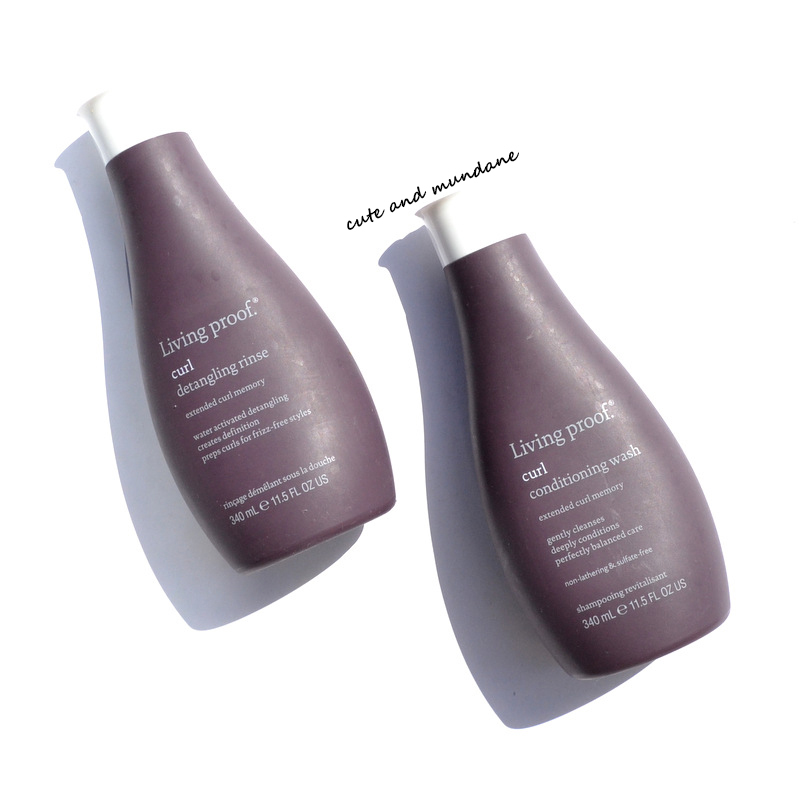 The Living Proof Curl conditioning wash ($26 for 11.5 oz) is a non-lathering, sulfate-free wash is both cleanser and conditioner in one. I found that the overall result was really soft, well conditioned hair. I feel a slightly heavier finish than other Living Proof shampoos, however this is expected with curl control products. However, like Living Proof products, it achieves a gorgeous finish without an oily or heavy silicone feel (so key!). 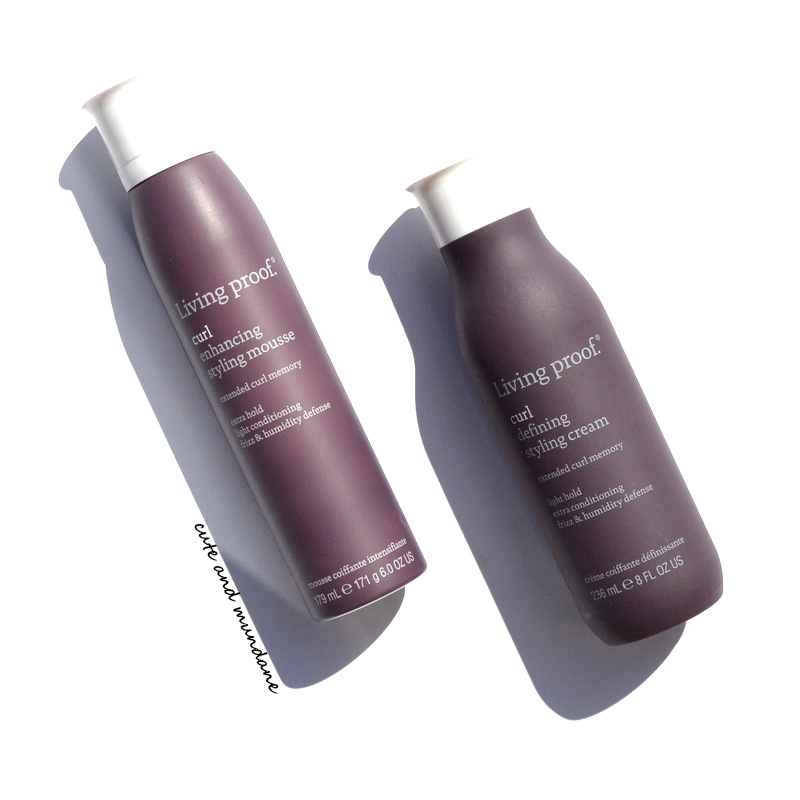 Because Living Proof products uniquely function with their patented OFPMA molecule, I find that cleansing with Living Proof products before using Living Proof styling products enhances their overall effect. If I do use another shampoo brand before styling, I prefer to use deep cleansers that leave my hair free of heavy residue so that the subsequent Living Proof styling products can work their magic. Tangling is an issue that just comes with the curly hair territory. (Thank you, Living Proof for recognizing this!) The Living Proof Curl detangling rinse ($26 for 11.5oz) is not a conditioner, it's a water activated detangler! After cleansing, the detangling rinse is applied to wet hair, then rinsed immediately. I was initially skeptical as to whether the 'detangling rinse' would make a difference, but was pleasantly surprised! The fruit-scented rinse immediately made it easier for me to run fingers or a comb through my hair. This is my favorite from the 'Curl' routine. I've used it to make my hair more manageable, even when I'm planning on straightening afterwards! 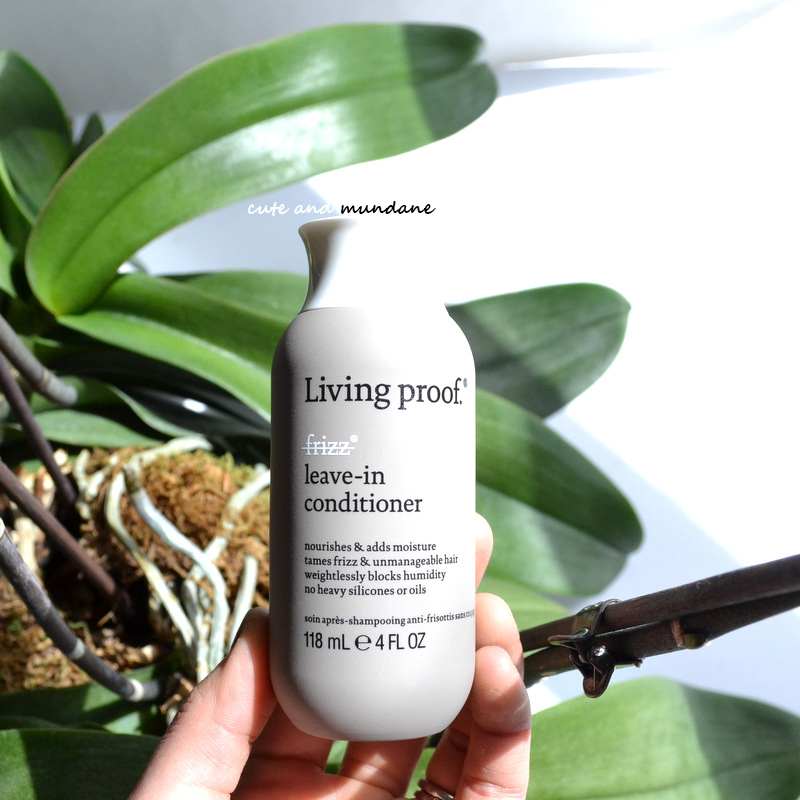 The Living Proof No Frizz leave-in conditioner ($24 for 4 oz) is an optional step to provide an extra dose of conditioning with added frizz protection. I was really happy to see this included in my set, as I was already a big fan of this leave-in-conditioner. (I leave a bottle at my parent's house for the times I visit!) 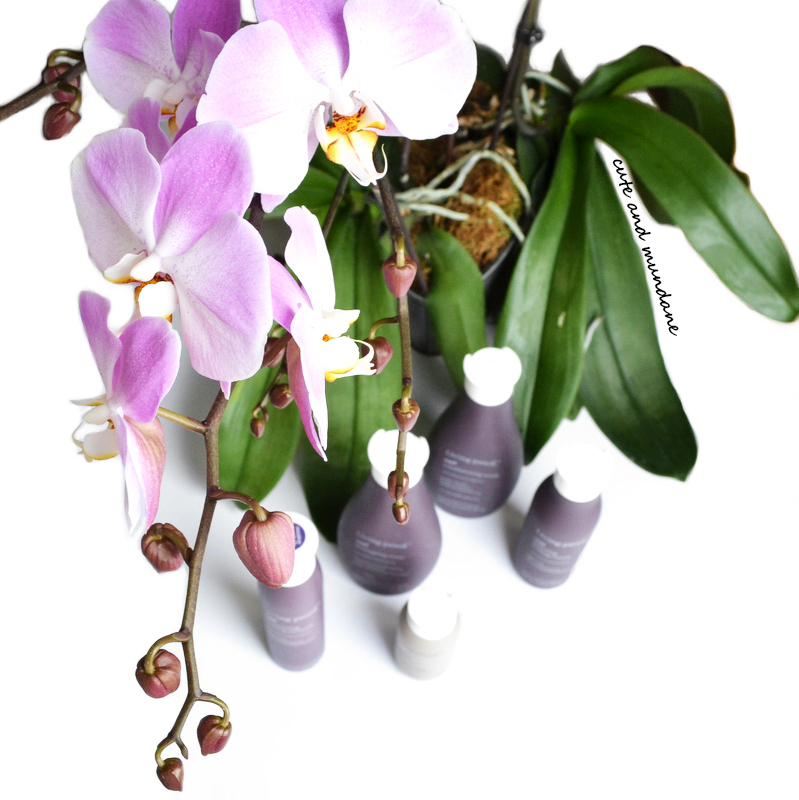 It does such an amazing job of creating soft, non-frizzy hair without weighing things down. It works nicely in the 'Curl' routine, but also well as a single-product for days you want a no-fuss hair solution! The Living Proof Curl defining styling cream ($28 for 8 oz) was designed as a finishing step for curly or coiled curls that can use extra conditioning. The product pumps out in lotion/cream form. To enhance curls, you can scrunch hair afterwards with a towel, whereas to elongated them, comb your locks after application! The Living Proof Curl enhancing styling mousse ($28 for 6 oz) was designed for waves or loose curls that need extra hold for definition (and oomph). Like your typical mousse, start with an egg-sized amount and apply evenly from root to tip, then scrunch the curls! You can finish with air drying or a diffuser. Tip: if you've used the Living Proof leave-in-conditioner beforehand, cut down on the amount of styling cream or mousse afterwards! In terms of the Living Proof defining styling cream vs. enhancing styling mousse, I'm favoring the styling cream as my hair is quite obstinate and needs more hold. I also like how I can comb creams more evenly through my hair. I think the choice between the two depends on your personal formula preference and hair type. I have nothing but good things to say about the newest Living Proof 'Curl' routine. (To be fair, I am a brand devotee...). Living Proof's OFPMA based formulas simply work for my hair; they give amazing frizz control without the weight of silicones and oil based formulas. 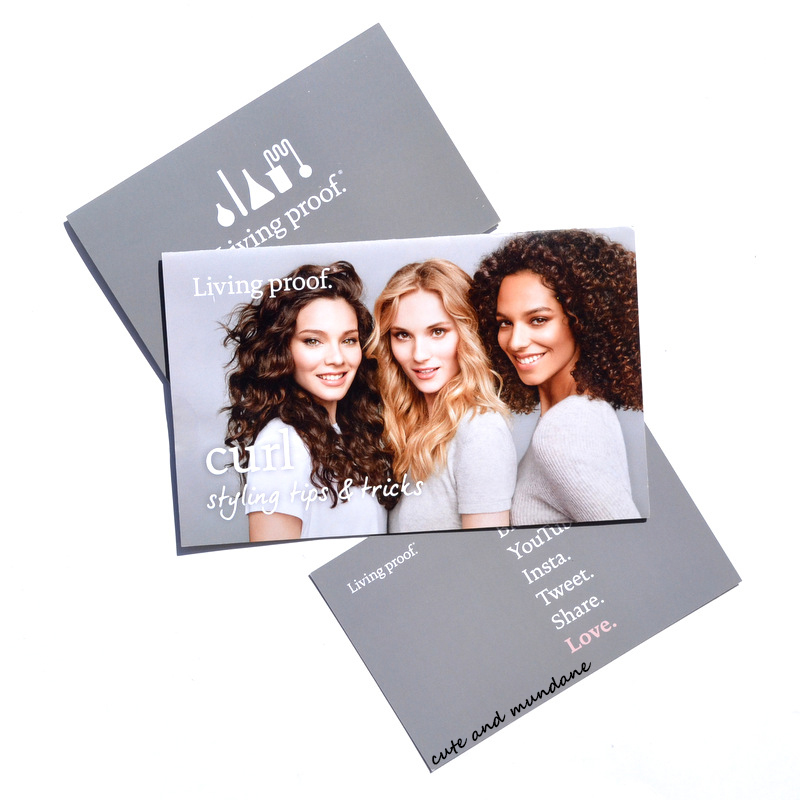 I'm really excited to add curly-hair targeted products to my Living Proof collection. They'll definitely come handy in the summer when I'm going for beach-y waves. P.S. I like to purchase my Living Proof haircare online at www.LivingProof.com. There tend to be great samples and minis! I'd bet that most of us have the one shade of lacquer we just can't seem to stop collecting; for me it's pale pink. 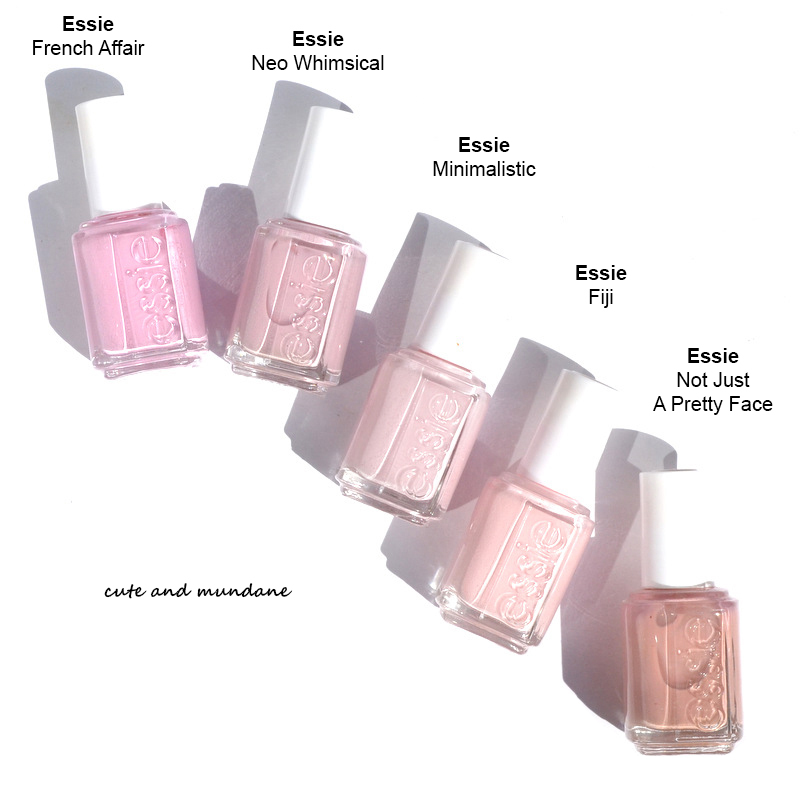 I must have at least ten (probably more) shades of Essie pinks alone, that would look practically identical to the casual observer. But to me, they're all so very different - with different nuances, sheerness, or even subtle sparkle! Different times of the year, and different occasions seem to call for different pale pinks. As of late, my pink of choice has been Essie Fiji. Essie Fiji is an interesting choice, as it's not one of my usual go-tos. It has the slightest touch of warmth that makes it a bit more sweet-tart than chic. For this reason, I generally prefer my 'cooler' BFF Essie Minimalistic (reviewed) when I want a pale pink. That said, there's something about early spring that calls for candied tones! Essie Fiji is an opaque pastel pink. It's every so slightly a yellow-pink, which gives it the candied character I mentioned above. The formula is decent, though not the best of my Essie Pinks; my main issue is that it doesn't level / even out as well as some of my other Essie polishes, despite having a steady hand. You could get coverage with two well placed coats, but I find that three thin coats works best to achieve even, full coverage. As a quick aside - I had to share a picture of my Echeveria subsessilis. It's one of my favorite new additions to my succulent collection. 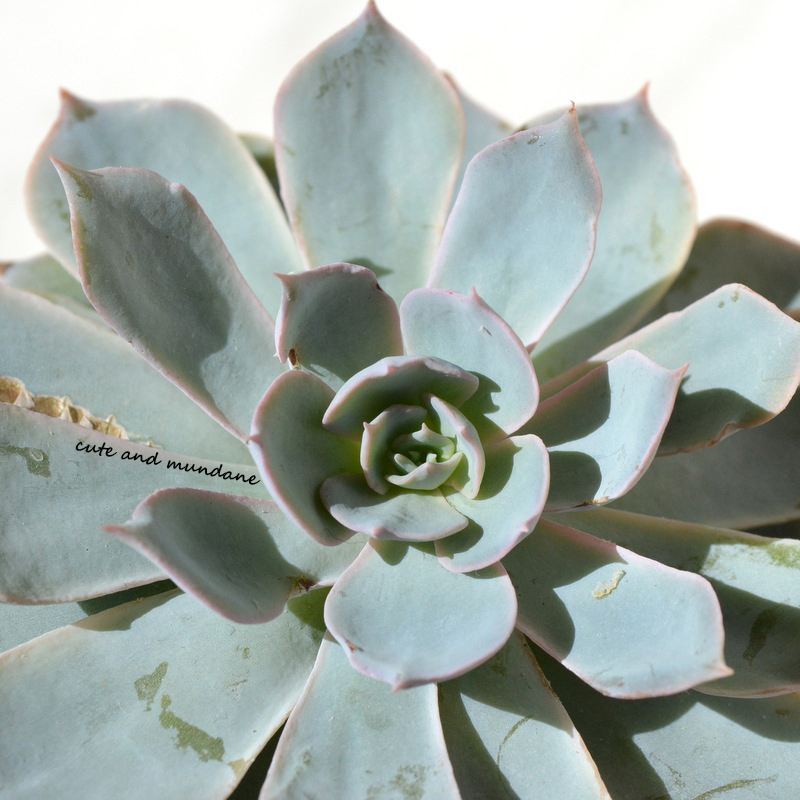 I love the pretty pink tips contrasted against the dusty blue leaves - such a perfect combination for spring! In terms of comparison swatches, I'm sharing the same set of shades as a previous post, as they really demonstrate the nuances between the different opaque pink cremes in my collection. Essie French Affair has more pink-lavender leanings. Essie Neo Whimsical is darker. Essie Minimalistic (reviewed here) is very similar, but cooler - and a bit more undertone free. Essie Not Just a Pretty Face is a warmer beige pink. 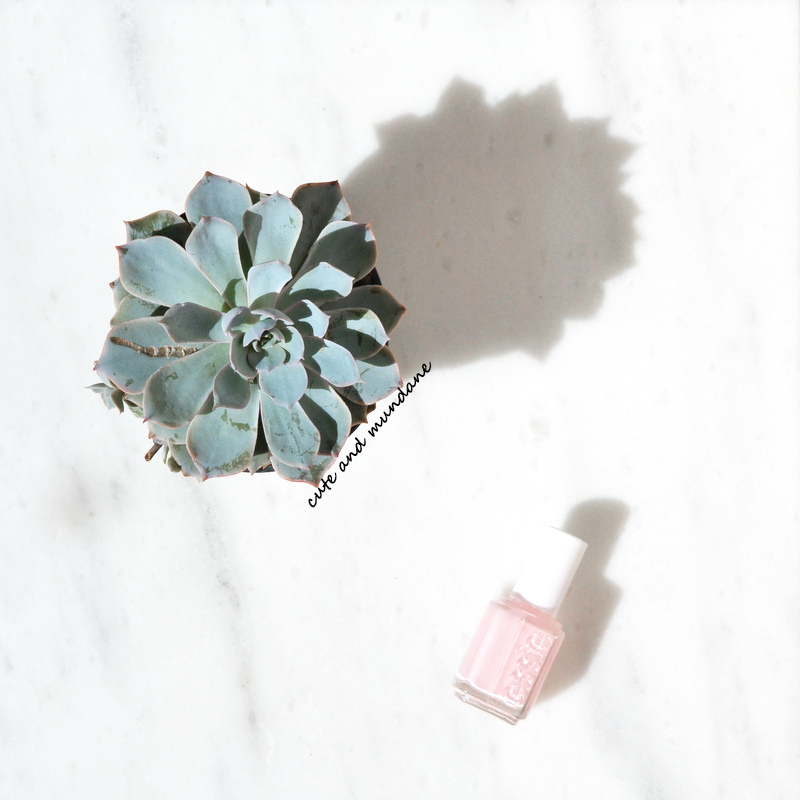 Overall, Essie Fiji is a sweet pink shade that works so well during early spring! It's not my year-round pink, but a fun shade to have in my collection. That said, I can see how those with more warmth in skin-tone might be able to pull it off on the regular. 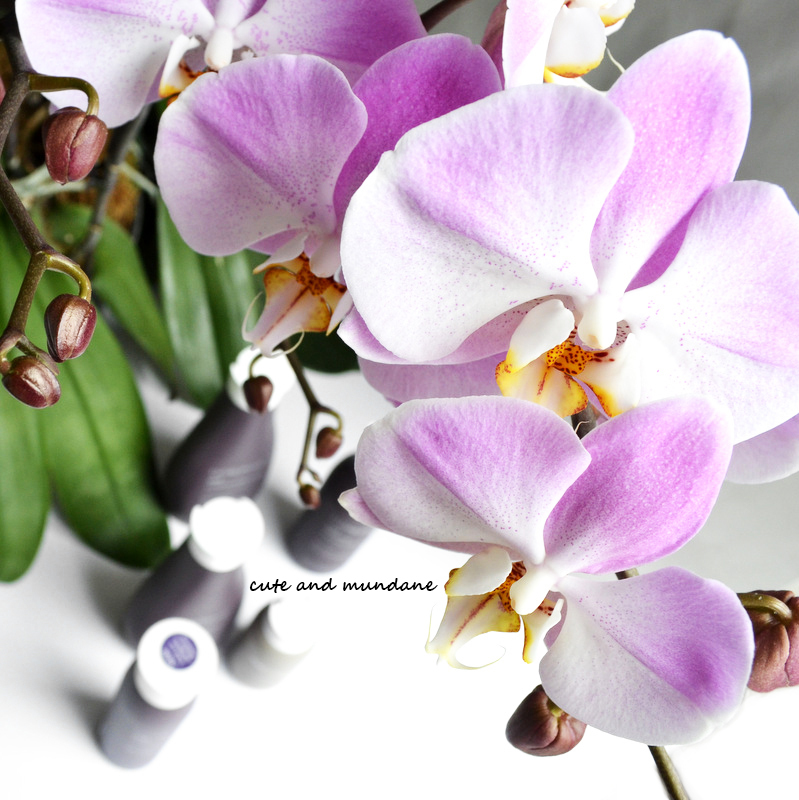 If you've tried Essie Fiji, let me know how it's worked for you! Thanks for reading! What lacquers are you wearing lately? 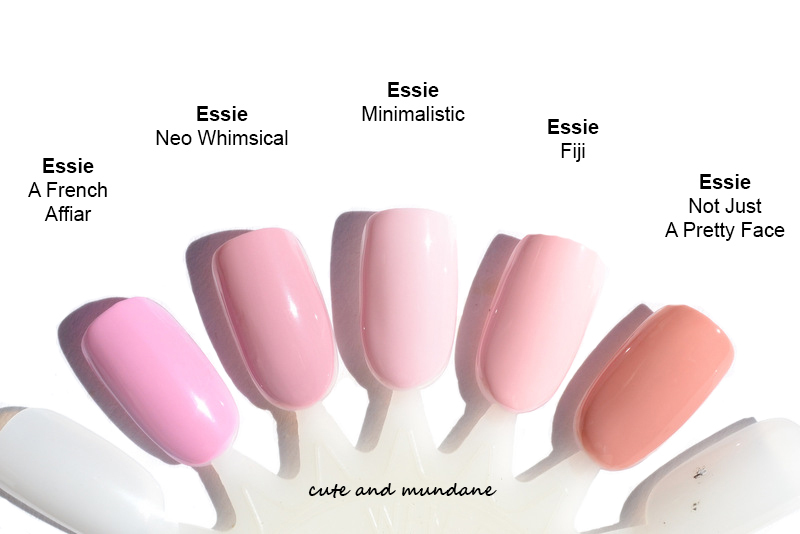 What Essie Pinks are your favorites? I never really imagined myself as a headband kind of girl, until I picked up my first Lululemon Bang Buster headband. It was a cute mint and dark green band from the 'We Made Too Much' (a.k.a. sale) section of the boutique. I wore it to yoga the next day, and the rest is history. The headband is so comfortable, and wicks away sweat that can really plague you during downward dog! Recently, I went back for more. As happy as I am to wear my 'toothpaste and fuel green' headband with anything, I figured it might be nice to get a couple more shades to color-coordinate with my outfits. I ended up getting the Lululemon Bang Buster headband in black and their newer model, the Lululemon Fringe Fighter headband, in Moody Mirage White / Black Cherry heather. (For reference, it seems that the latter is eventually going to replace the former in the Lululemon lineup). As I've worn the two different models, I've come to realize how different they actually are. (Wide headbands are not all created equal, it seems!) I don't think the differences between the cult-favorite Bang Buster headband and it's successor, the Fringe Fighter have been extensively discussed online as of yet, so I'm hoping this will be a useful comparison post for fellow headband lovers! 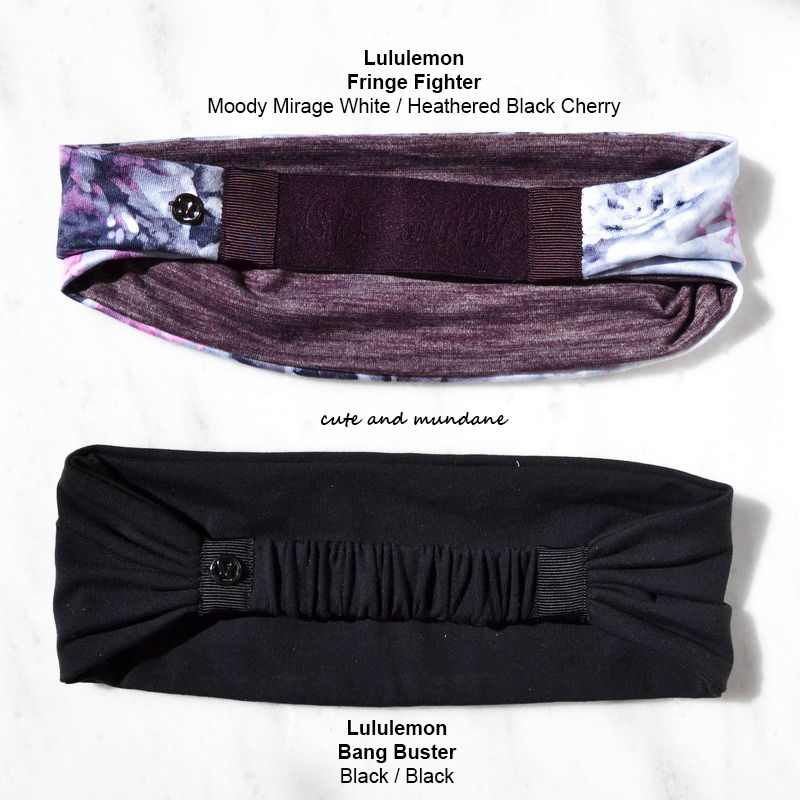 From afar, both the Lululemon Bang Busters and Fringe Fighters look like your typical wide headbands. (I have a feeling that that's what Lululemon corporate is hoping we'll think). However, up close they couldn't be more different. The original model, the Lululemon Bang Buster is much more complex and well constructed. 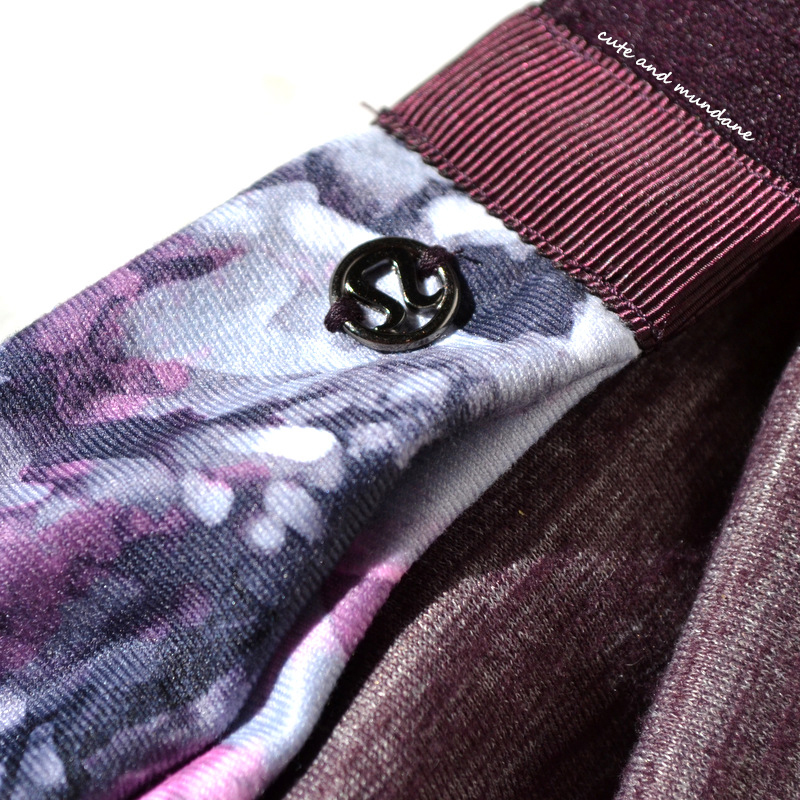 The ends of the band end in pretty ruching, which is both aesthetically more pleasing and more functional (which I've written more about in the 'Comfort' and 'Looks' sections below). The back elastic band is also covered by ruched fabric. The new model, the Lululemon Fringe Fighter, has a much more simple (read: cheaper to manufacture) construction. It has a single fold to help the fabric fan out. Supposedly the thinking behind that fold is that one can easily fold the fabric over and wear the Fringe fighter as a thinner headband. It's a nice thought, except I find that the band won't stay put on my head in that form. (And if I wanted that, I'd buy a different headband). The back elastic band is not covered by any fabric. It's made from elastic bearing the words 'Lululemon Athletica' and the logo, except you'll never get that entire phrase. For example, mine says '(omega) athle'. Needless to say, not the best branding. 92% polyester <-- not the same!! I don't know about you, but I find that nylon typically holds up better than poly. I also like the thicker, cooler feel it has. You can see the single fold in the new Lululemon Fringe Fighter headband here. 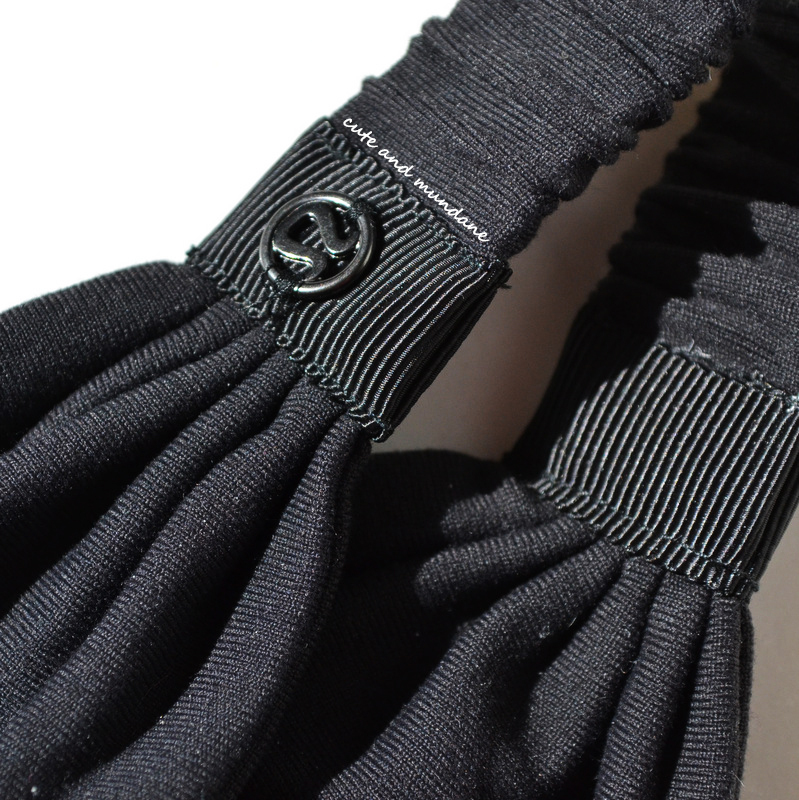 The charm is also sewn onto the headband itself. Both headbands have the same Lululemon charm sewn on, but in different places. On the Bang Busters, the charm is on the ribbon (which I imagine is harder to do), whereas it's sewn onto the fabric of the Fringe Fighters. Also of note, there is a printed reflective logo on the reverse side of Bang Busters, as the headbands are reversible. I noticed that my Fringe Fighter headband did not have this little logo detail, which is a bummer! Because of the thicker, better quality fabric and the detailed ruching, the Lululemon Bang Buster looks better as a standalone headband. You could say that from afar, there's not a big difference. However, I'd argue otherwise. I find that the difference is more obvious when dealing with solid colors and/or simple prints. When shopping for a black headband, despite the lure of a double-sided Fringe Fighter (who doesn't want two prints for the price of one? ), I had to go with the black Bang Buster shown here. It simply looked more expensive, even from afar. That said, I do think that you can get away with Lululemon Fringe Fighters, especially when they're made of complex, eye catching prints (like Moody Mirage, shown here!). The print distracts from the lack of detailing and cheaper material. In terms of the back band, it's a toss-up. I do like the ruching of the original Bang Buster. That said, the flat elastic of the Fringe Fighter is sleek. And here's the most important point of the article: the Lululemon Bang Busters are more comfortable than the Lululemon Fringe Fighters! I fell in love with the Bang Buster model because it was so comfortable that I could wear it all day. I do find the Fringe Fighters to be comfortable enough during yoga sessions and a little beyond. However I do feel more pressure from the band (particularly at the front) and find that it can start a mid headache if worn too long in the same position. (I'll often fiddle/fold it to prevent this). I really think the key to the comfort factor lies in construction! The original Bang Buster has ruching that not only is pretty, it functionally distributes the pressure evenly across the head. The new Fringe Fighters has the single-fold construction that leads to more uneven pressure loading, hence the pressure points / headache. The original Lululemon Bang Buster has more complex ruching sewn in at the junction, and at the back band. I find that the ruching actually results in a more functional, comfortable headband (in addition to looking pretty). Thanks for reading! I hope you've enjoyed this in-depth review of the wide and wonderful world of Lululemon headbands. (I admit I do feel quite silly having written the words 'Bang Buster' and 'Fringe Fighter' so many times!) I'm hoping to have more Lululemon to share with you in the future, as it's been fun exploring the brand. 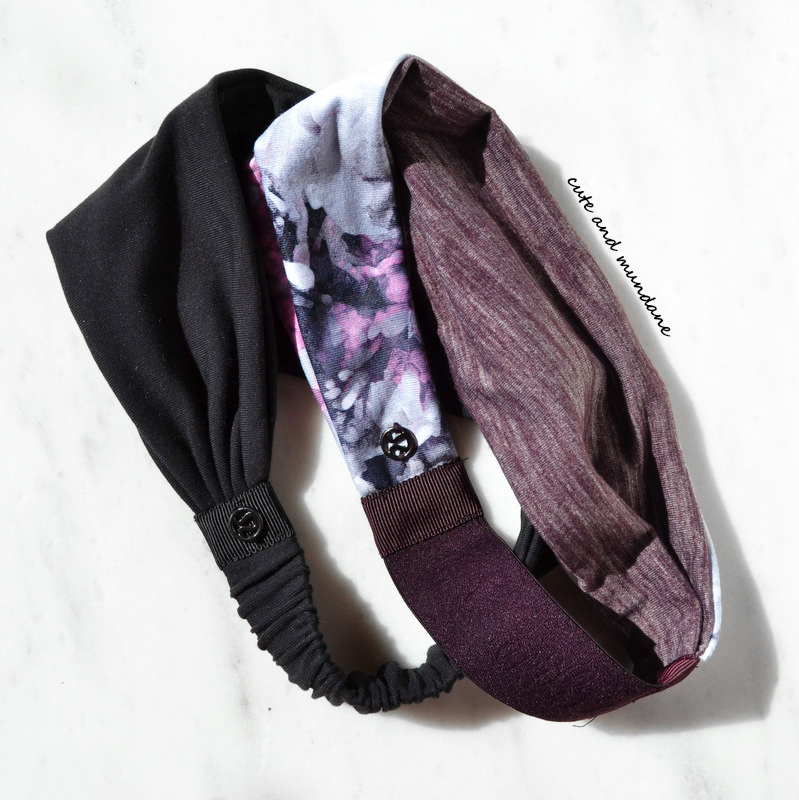 In the meantime, I'd love to know: what are your experiences with Lulu headbands? What are your Lululemon must-haves?